The art and art installations presented in nine downtown windows are by the AS220 Print Shop, Babette Allina, Ted James Butler, David J. Delay, Walt Chaney, Marjory Garrison, Peter Lutz, C.W. Roelle, and Rebecca Siemering, with a special presentation of Picturing America images. This Fall installation series contains artists invited by the Director that reflect intensive labor, obsession for materials or passion for subject matter. Materials range from adhesive vinyl, sound, lottery tickets and wire, to the City of Providence as a subject. To take the tour on your own, please click on the downloadable map above. When you take the tour, you will notice several selections from the Picturing America Supplementary Materials for RI Educators. Providence Art Windows partnered with the Rhode Island Council for the Humanities( RICH ) to display a selection of the Picturing America reproductions relating to the RI Educators packet at The URI College of Continuing Education Library in the Shepard Building at 80 Washington Street and in windows whose artwork reflected similar themes in the packet of historical works. To learn more about Picturing America, and RICH, please go to rihumanities.org. 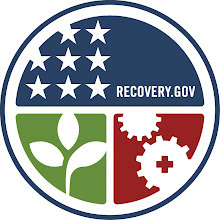 Please note, the URI Library section with AS220 Print Shop is down but lives online. 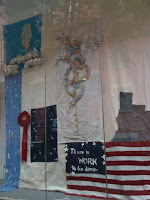 Go to http://www.flickr.com/photos/providenceartwindows/ to see pictures of the installation. This is one of those projects that you started nine years ago and finally, actually finished it. Two Wooden Renderings of a Building is primarily made from recycled fence wood that was cut into various sizes. Through the years I would advance the project slowly until it felt right. They are a pair and only work for me in this position. Found Object because it is so rough that it looks found. Walter C. Chaney has a BA from the University of South Florida and an MFA from the university of Utah, SLC, Utah. “Since slides have become extinct I have shown very little, so I appreciate the invitation to show here at Providence Art Windows.” Walter has created models for Hasbro and as a freelance model builder for over 23 years. Visual representations of sound. If you come to the window, and there is a break in the music, tracks can be heard individually here:http://hillsandvalley.info. Ted James Butler is a Providence-based electronic musician and visual artist. His current projects include Risqué Bouquet (Japanese Butoh-inspired movement with live electronics / noise), Hills & Valley (organic ambient drone), his full band Paper Eagles and a myriad of solo work under the name Ted James. A self-taught artist, Ted integrates his work into daily life, giving way to true transparency on his blog, beteroffted.com. Follow Ted on Twitter at twitter.com/betteroffted. David Delay lives in Providence and has a studio in Pawtucket. He attended the Rhode Island School of Design for two years in the 1980's and returned to get his certificate in Natural Science Illustration in 2007. He is a member of the New England Chapter of the Guild of Natural Science Illustrators and The Pawtucket Arts Collaborative. With these groups he has shown his work throughout New England as well as at The Providence Art Club and the “First Thursday” event in Boston. He also has a line of note cards and everyday and holiday cards. This and his other artwork can be viewed on his website www.davidjdelay.com. Patterns of tree canopies have always intrigued me and I wanted to create a static image that would shift with the viewer’s perspective. The opportunities provided by the large expanse of glass of the storefront were too good to pass up so I have accommodated the glass itself into the piece. The image is created with adhesive vinyl, which attaches directly to the glass. I’ve always believed that the storefront window acts like a mirror, as well as a display case, showing the viewer themselves as well as the product inside, allowing them to evaluate their self worth while being confronted by the object of their desire. Behind the vinyl is a layer of reflective Mylar, which not only reflects the vinyl image, but also the surrounding view of the street and buildings and ambient light. As Providence citizens pass by they are presented with several sets of overlapping patterns and shifting perspectives. Peter Lutz is a mixed media artist with a diverse body of work ranging from printmaking, ceramics, mixed-media installation, and video. Peter was awarded the 2009 RISCA Fellowship for New Genres and has exhibited in Rhode Island, New York, Kansas City, Florence, Italy, and Prague, Czech Republic. His most recent piece, “Cleave” was featured at the group show “De/construct II” in Providence RI. Currently, Peter’s work can also be seen in Pixilerations [v.6] exhibition in conjunction with First Works Prov,opening Sept 24 - Oct 11 in Providence. For more information about the artist, please go to peterlutz.com. 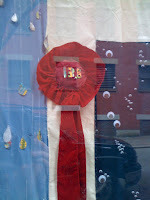 Rebecca Siemering, Director of Providence Art Windows(PAW), creates this time-based installation. The Fall installation for series for PAW contains artists invited by the Director that reflect intensive labor, obsession for materials or passion for subject matter. Several artists and collectives within this round of Art Windows have an intense enthusiasm for making Providence a better place to live and work. For the work created by the Director, Piece(work), will be a large, “crazy” quilt, with pieces culled from the streets of Providence and the news of the day. The quilt will be a reflection of the time from September 1-December 1, 2009, the duration of the show, and a new section of the quilt will be added every week. Since a window reflects the viewer and the city, the installation as a finished piece of art will also reflect the City of Providence. The city is a work in progress, and this quilt is a hopeful, demonstration piece. Come back every week to see the progression, and read more about the thoughts behind the creation of each panel at siemering.blogspot.com. Rebecca has a BFA from Washington University in St. Louis. It builds on an ongoing effort to create a lexicon of marks derived from objects natural or otherwise. Some marks are accidents, duplicated repetitively, until they become part of the vocabulary. Recently, the work has taken the form of paint incased in resin to create visual “stains”, or in collaboration with the Rowley lab at URI, light emissions using bioluminescent bacteria and chemical inhibitors. The processes that are being explored are dictated by the ideas of containment, and public vs. private communication. Babette Allina is a painter living and working in Rhode Island. 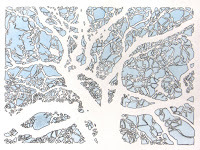 Recent exhibitions include Myopic Books: http://vieralevitt.org/myopic/allina.htm, the Wheeler Gallery, and the University of Rhode Island Galleries. Her work has appeared in various publications including ArtNews, Urban Design and New York Magazine. She earned her BA in politics and painting from Bennington College, and an MA in political science from the University of Rhode Island. She is employed by the Rhode Island School of Design. An interactive piece that will keep you coming back for more. It's a story that starts in September and goes till winter. Daily recorded messages will be curated over the next three months, so call, and call again! Call 401.626.4414 to hear a new sound or story every day. Marjory Garrison spends far too much time on the phone these days, helping nonprofits around the country design and run grassroots campaigns. A writer and campaigner by trade, she likes drawing her friends into curious encounters and curated group experiences, whether through her mail art shop or thebiggestlittle.org. She is inspired by mileage and story-telling, and would like to make a career of sitting and listening to the stories you tell on long road trips. * Please note the installation with the AS220 PrintShop is in transition. It lives online at the Flickr page, and the collective web site below. The AS220 Community Print Shop Key Members, in collaboration with the general public and the Providence Public Library, have screen-printed and installed new work in the window of the University of Rhode Island’s downtown library. Interested pedestrians who passed by a sidewalk-based screen-printing station received a simple prompt; “What would you like to see more of downtown?” In front of them lay a small assortment of illustrations – including trees, tunnels, bridges, and bicycles- that had been culled by Key Members from the Special Collections at the Central Branch of the Providence Public Library and prepared as silkscreen stencils. 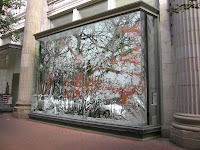 The images selected by the participating public were then screen-printed onto translucent window film. Once dry, these visual records of the public’s wishes were composed by the Key Members in the URI Libraries’ windows facing Washington Street. The artwork that CW has chosen to show with the Providence Art Windows are examples of his wire drawings that he feels contain movement. Lines are fluid things that easily put into motion static figures simply by running around and through them. Like veins. CW Roelle's first job was picking corn. He quit after two days. The next job was at an ice cream parlor called Bud's Polar Bear. That one lasted long enough for him to pay for a school trip to Europe and then he quit one day so that he would have the night off and could then attend a small party at a friend’s house. After the trip and a number of babysitting and lawn mowing jobs he gave in to his own reluctance and took a job at the grocery store where his father was the night manager (he became a daytime stock clerk and had to get a hair cut). Moving to Baltimore to attend The Maryland Institute College Of Art freed him from that job (except, that is for his first Christmas break and the summer between his freshmen and sophomore years when he went back for a bit). His first job in college was an 8-hour a week work-study shift at the school bookstore. There were some pretty cushy work-study jobs, that wasn't one of them. Working only 8 hours a week made it difficult to buy things like art supplies and food so he took a job at the security desk at the dorms. The security shifts were overnight (11-7) and he was able to get a lot of his class work done. Then during his sophomore year the opportunity to work at a nearby video store arose and he lept at the chance. To get the job he had to write an essay about what movies meant to him. Now he worked three jobs and was going to school full time. This continued until he graduated, except for the work-study, which turned into working as the bookstore late night janitor. After graduation he continued on at the video store and working security shifts for a little while and then he was hired as a shuttle driver for the school. The shuttle job was great until things started change in the management of the security office and he quit working for the school all together. The video store wasn't enough to live on so in his last months in Baltimore he took a job as a doorman at a local rock club, he was paid five dollars an hour and whatever he wanted to drink (always diet coke). The day came in early 2000 when the time was no longer live-withable in Baltimore and Mr. Roelle moved to Providence RI, the only other city where he had friends (his family lived around Rochester NY, but that town was as enticing as New England). Upon moving he quickly got a job as a parking lot attendant via a friend from college who was doing the same thing. Now it is nine years later and though he works for a different company, he is still working parking lots. It is a job that allows a lot of down time in which he can work on his artwork, at the moment he is holding shifts in that first garage and another one, having 11 other lots under his belt. Stop by outside the URI Library today, or tomorrow or Wednesday (beginning at 10 AM every day). The AS220 Print Shop, for their Art Windows piece, will be making prints on site to put in the windows, asking the question, "What do you want for Providence?" The resulting tally of printed images will show what passers by, who work or live in the city, what they think Providence needs most in Downtown. Images so far include more green space, more room for bikes, courteous behavior, affordable living, etc. New images will be made every day from a poll of passers by. Come down and participate if you can. Go to the URI Library Windows on Washington Street to participate!